Member of the Military Lodge No. 728, Dublin. Garnet Joseph Wolseley was born on the 4th June, 1833 at Golden Bridge House, County Dublin, the eldest son of Major Garnet Joseph Wolseley of "the King's Own Scottish Borderers" (25th Foot) and Frances Anne Wolseley (née Smith). The Wolseley family was descended from an old Saxon family that had been granted one of England's oldest estates in Staffordshire by King Edgar. King Charles I granted the family a baronetcy in 1628. In the 1690s Brigadier-General the Right Hon. William Wolseley was allegedly rewarded with lands in Ireland for service to King William III during his campaigns against the Catholic James II. This grant of lands was not, however, easy to prove, and in the early 1730s Garnet Wolseley's great-grandfather, Colonel Sir Richard Wolse­ley, Bart, went to Ireland to attempt to settle the claim. He was unsuccessful, but married and settled in Tullow in County Carlow, thereby founding the Irish branch of the Wolseley family. One tradition dominated in the Wolseley family - military service. Wolseley's grandfather had served with the Royal Dragoons in Germany during the Seven Years' War, and then became a clergyman in Northern Ireland. Both Wolseley's father and uncle served with the King's Own Borderers. During the Napoleonic Wars they missed the excitement, glory and chance for prize money offered by the war in the Peninsula. Instead, the Wolseleys were stationed in the West Indies, where the tedium of garrison life was broken only occasionally by brief expeditions against the French on the islands of Martinique and Guadeloupe. Lacking the finance to purchase a promotion and bitterly disappointed with military life, Wolseley's father sold his com­mission as a major and returned to Ireland to marry. His wife and Garnet's mother, Frances Ann Smith, was the daughter of a pious Protestant English­man, William Smith. They settled in Golden Bridge House near Dublin, which they rented from her father who returned to England. Wolseley's father died when he was seven years old, leaving the family to struggle on his army pension. This poverty was to have a great effect on his life, both immediately and in the future. It meant that he could not be sent to England for his education, like other boys of his class - instead he attended the local day school. Poverty forced Wolseley to leave school when he was fourteen years old. The young boy took up employment in a land surveyor's office in Dublin to bring money into the family and to further his knowledge of mathematics and surveying. His talents in surveying served him well later in the army. The first career considered by Wolseley was the Church, another family tradition, but the purchase of a clerical living required either finance or a wealthy patron, both of which the Wolseley family lacked. The army seemed a more attractive proposition, but lack of finance was again a major stumbling block. There were several ways in which a commission in the army could be obtained. The most common method was to purchase a commission. The regulation price for a commission as an ensign in a line regiment was £400. Above-regulation prices were the norm, and Wolseley could have expected to pay double the amount set out by law. Another means of gaining a commission was to attend the officer cadet school at Sandhurst, but Sandhurst demanded fees and Wolseley’s family with six other children to provide for, could not afford neither the purchase of a commission nor the fees. This left the last method: nomination to a commission by the Commander-in-Chief. In 1847, when he was fourteen years old, Wolseley first appealed directly to the Duke of Wellington, the Commander-in-Chief, stressing his father's twenty-nine years' service in the army. The Duke received many such requests from the sons of impoverished army officers, including sons of his Peninsular colleagues but, despite Wolseley not falling into that category, promised to consider him for a commission when he reached the minimum age of sixteen. He remained at the land surveyor's office and studied algebra, field fortifi­cation, history and geography, French and Latin in the evenings so that he would have the basic educational requirements for a commission. In 1850, when he was seventeen, he wrote again to the Duke asking for a commission. When his request was ignored, he turned his attention to Lord Raglan, the Duke's Military Secretary. The army had recently suffered losses in the latest Kaffir War in South Africa and Wolseley hoped to be nominated as a replacement. He ended his letter that "I shall be prepared to start at the shortest notice, should your Lordship be pleased to appoint me to a regiment now at the seat of war". Again he was ignored by Horse Guards. In September 1851 his mother took up his case, writing to the Duke as a poor widow of an old officer'. At first it seemed that the Duke had again overlooked Wolseley, but on 12th March, 1852 he was gazetted an ensign in the 12th Foot at the age of eighteen. A Young Ensign Wolseley, whilst with the 80th Foot c.1852. He then transferred to the 80th Foot on 13th April, 1852, with which he served in the Second Anglo-Burmese War. He was severely wounded in the thigh on 19th March, 1853 in the attack on Donabyu, was mentioned in despatches, and received the war medal. Promoted to Lieutenant on 16th May, 1853 and invalided home, Wolseley transferred to the 84th Regiment of Foot on 27th January, 1854. On 24th February, 1854 he was transferred to the 90th Light Infantry, at that time stationed in Dublin. As the Brethren of the Military Lodge No. 728 are well aware, it was during his posting to Dublin(3) that the young Lieutenant Wolseley was initiated into the Craft. Due to his age - he was not quite twenty-one - he was initiated under special dispensation. 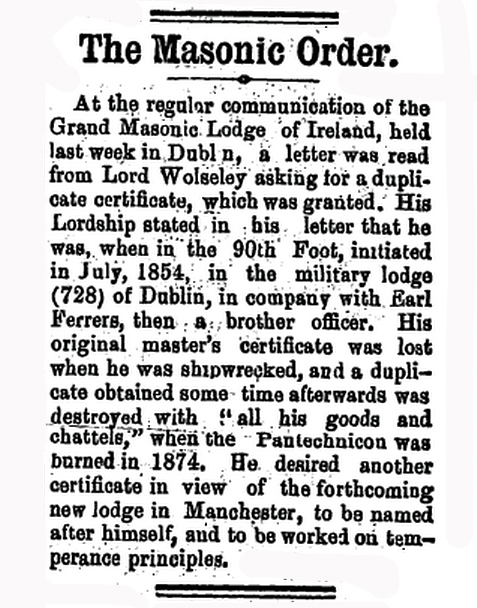 Wolseley referred to his intiation into the craft in his memoir "The Story of a Soldier's Life" stating that "During my period of service in Dublin in 1854 I was initiated as a Mason in Lodge No. 728, and under a special dispensation was raised to Master's Degree when under age. Upon returning to Ireland in 1890 as Commander of the Forces, I rejoined that Lodge, and was its Master for two years." Wolseley was initiated as an Entered Apprentice on the 13th April, 1854, passed as a Fellow Craft on the 21st April, 1854 and raised to the Sublime Degree of a Master Mason on the 21st July, 1854. On the 21st of January, 1893, having served as Senior Warden in 1892, Bro. Wolseley was installed as Worshipful Master of the Military Lodge No. 728. He was also Worshipful Master for the following year in 1894.
whilst serving with the 90th during the Siege of Sevastopol, Crimean War. His posting to Dublin ended when he accompanied his regiment to the Crimea. He sailed from Dublin on the 19th November, 1854, landing at Balaklava on the 4th December, 1854. He was selected to be an assistant engineer, and attached to the Royal Engineers during the Siege of Sevastopol. Wolseley served throughout the siege, where he was wounded at "the Quarries" on 7th June, 1855 and again in the trenches on 30th August, 1855 losing an eye. After the fall of Sevastopol, Wolseley was employed on the Quartermaster-General's staff, assisting in the embarkation of the troops and supplies, and was one of the last British soldiers to leave the Crimea in July 1856. For his services he was twice mentioned in dispatches, received the war medal with clasp, the 5th class of the French Légion d'honneur and the 5th class of the Turkish Order of the Medjidie. Garnet Joseph Wolseley, 1st Viscount Wolseley by Paul Albert Besnard. Wolseley had what only be described as an illustrious military career. In 1857-53 he served in the Sepoy Mutiny and ac­companied the Anglo-French expedition into China in 1860. From 1861-71 he was in Canada, where he command­ed an expedition to quell the uprising in Red River in 1870. He commenced the Ashanti expedition of 1873-74 and was commander of Natal in 1875, Cyprus, 1878 and Southeast Africa, 1879-80. He suppressed the rebellion in Egypt with a victory at Tel el-Kebir in 1882. One of his most famous commands was the Nile expedition of 1884. His goal was to relieve General Gordon at Khartoum. The expedition arrived too late; Khartoum had been taken, and Gordon was dead. In the spring of 1885, complications with Imperial Russia over the Panjdeh Incident occurred, and the withdrawal of that particular expedition followed. For his services there, he received two clasps to his Egyptian medal, the thanks of Parliament, and was created Viscount Wolseley, of Wolseley in the County of Stafford, and a Knight of St Patrick. He was given the substantive rank of General on 21st January, 1887. Wolseley's interest in Freemasonry continued throughout his military career holding the rank of Past Grand Warden in the United Grand Lodge of England. As you will see from below he lost his original Master Masons certificate in 1857 when the ship, "The Transit", was shipwrecked in the Straits of Banca in the Far East. The duplicate that issued was subsequently destroyed when the Pantechnicon, a "fireproof" storage facility in Motcomb Street, Belgravia, London burnt down in 1874. This information came to hand as a result of a letter sent by Viscount Wolseley in 1883, to the Grand Lodge of Ireland, coming into the public domain. The letter was widely reported around the world, especially those of the colonies, and the report reproduced below is from The Manawatu Standard, New Zealand. In one respect it gives an indication of the interest in Freemasonry but more particularly how famous a person Viscount Wolseley was worldwide. "At the regular communication of the Grand Masonic Lodge of Ireland, held in Dublin, a letter was read from Lord Wolseley asking for a duplicate certificate, which was granted. His Lordship stated in his letter that he was, when in the 90th Foot, initiated in July, 1854, in the military lodge (728) of Dublin, in company with Earl Ferrers, then a brother officer. His original master's certificate was lost when he was shipwrecked, and a duplicate obtained some time afterwards was destroyed, with "all his goods and chattels," when the Pantechnicon was burned in 1874. He desired another certificate in view of the forthcoming of a new lodge in Manchester, to be named after himself, and to be worked on temperance principles." Wolseley continued at the War Office as Adjutant-General to the Forces until 1890, when he became Commander-in-Chief, Ireland. We know from above that Wolseley reestablished contact with his mother Lodge, the Military Lodge No. 728. It is clear that this is something he took seriously because he became fully involved with the activities of the Order. In 1892 the Female Orphans School of Ballsbridge held a Grand Bazaar to celebrate its centenary and in the Centenary Book(5) produced for the occasion we find reference to the stall of Lodge No. 728 being presided over by Lady Wolseley, along with all the other Masonic wives and daughters, including The Hon. Miss Wolseley. "Slideshow" of the pages relating to the Military Lodge No. 728 contained in the Centenary Booklet published in 1892 to celebrate the the Centenary of the Female Orphans School, showing Lord Wolseley as Senior Warden for 1892 as well as the involvement of both Lady Wolseley and The Hon. Miss Wolseley with the Military Lodge stall. The Patrons of the "Centenary Movement" are also shown and you will note The Viscountess Wolseley appears on the list. As stated above Lord Wolseley was installed for the first time as Worshipful Master on the 21st of January, 1893, and continued in the Chair in 1894. His interest in the support of Female School continued as it was reported in 1893(6), in regard to Lord Wolseley's attendance at a Female School function..."We understand that General the Right Hon. Viscount Wolseley, Commander of the Forces in Ireland, has intimated his intention of taking part in the procession this evening, as Master of his Lodge. His Lordship has already expressed his appreciation of the school drill and marching of the children, and it is expected that on this occasion there will he a large attendance of the officers of the garri­son." He was promoted to be a field marshal on 26 May 1894, and appointed by the Conservative government to succeed the Duke of Cambridge as Commander-in-Chief of the Forces on the 1st November, 1895. This was the position to which his great experience in the field and his previous signal success at the War Office itself had fully entitled him. Field Marshal Viscount Wolseley's powers in that office were, however, limited by a new Order in Council, and after holding the appointment for over five years, he handed over the command-in-chief to his fellow field marshal, Earl Roberts, on 3 January 1901. He suffered from a serious illness in 1897, from which he never fully recovered. He was awarded the Volunteer Officers' Decoration on 11th August, 1903. He was also Honorary Colonel of the 23rd Middlesex Regiment from 12th May, 1883, Honorary Colonel of the Queen's Rifle Volunteer Brigade, the Royal Scots (Lothian Regiment) from 24th April, 1889, colonel of the Royal Horse Guards from 29th March, 1895 and colonel-in-chief of the Royal Irish Regiment from 20th July, 1898. 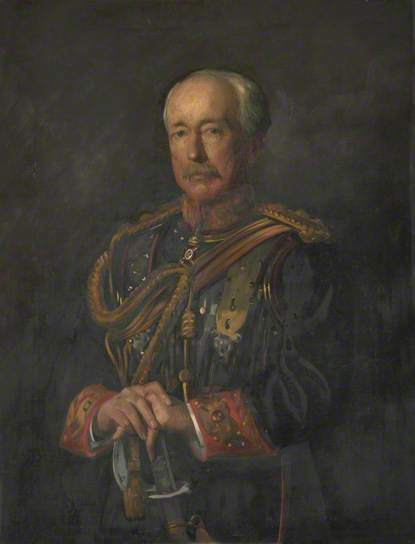 Field Marshal Garnet Joseph Wolseley. He died on 26th March, 1913, at Menton on the French Riviera and was buried in the crypt of St Paul's Cathedral, London. As I stated above it is hard to appreciate now with the effluxion of time how famous and in such high regard Viscount Wolseley was held and the fact that he did not forget his Masonic roots says a lot as to the character of the man. (1) "Man is a wolf to his fellow man"
(2) "The Story of a Soldier's Life" by Field-Marshal Viscount Wolseley, Volume I, published 1903. (3) Wolseley poor upbringing in Dublin may have jaundiced his subsequent opinion of Dublin City. In his book he relates that "Dublin was then a dreary quarter for a man like me who could not afford to hunt, and whose wounded leg pre­vented him from dancing. Its fragrant (?) [sic] river, its quays lined with decaying houses, its squalid streets, made it an undesirable and depressing place of residence." (5) see "The Masonic Girls School, Dublin." (6) I found reference to this in "The Proceedings of the Grand Lodge of Ancient Free and Accepted masons of Canada", 1893. You can access a webpage through the following link ~ "The Early Years of the Military Lodge of Ireland 728 (1846 - 1922) and Some of its Famous Brethren" ~ a Paper by R.W.Bro. Noel H. Ingram PC (1990), reproduced from the Lodge of Research No. CC Transactions, 1991-1993, Volume XXII, pages 116-130. I have added several pictures and footnotes which did not appear with the Paper, which I think will of interest to the reader. This history is to complement this webpage on Field-Marshal Garnet Joseph Wolseley, and the webpage on Field-Marshal Lord Roberts which will be appearing in due course.